Though a rough grid has been in command of the Queens street layout as dozens of separate housing developments knit together disparate small towns in Queens over the decades of the 19th and 20th Centuries, many major Queens routs follow the same paths they did in the colonial era, when they first evolved from Native American trails, which may even have followed the traces of wild animals. An interesting case in point is Grand Avenue in Maspeth and Elmhurst. It is currently an eastern extension of Brooklyn’s Grand Street, which runs from the East River to Newtown Creek, nearly straight as a string. After crossing the rickety truss Grand Street Bridge, first built in 1901 and now slated for a replacement, Grand Avenue twists and turns, meandering northeast to the old town center of Elmhurst (Newtown) at Queens Boulevard and Broadway. 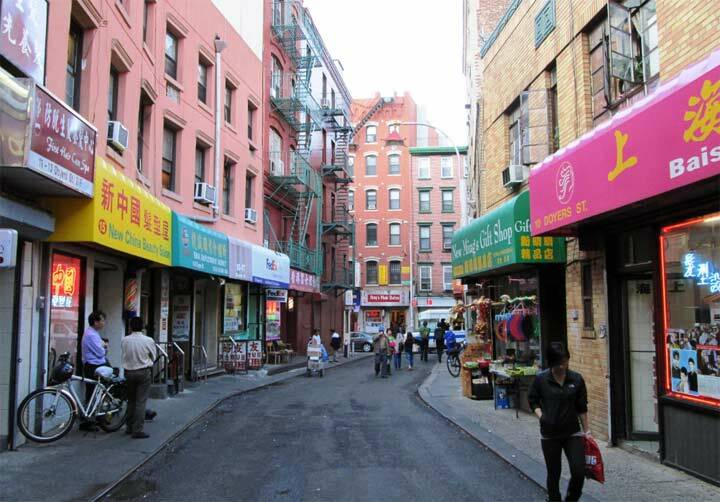 But the modern Grand Street-Grand Avenue system is a relatively recent development. This 1852 map illustrated it clearly. What we now know as Grand Avenue, the main drag of downtown Maspeth, is actually an eastern extension of Maspeth Avenue, which runs from Bushwick and Metropolitan Avenues in Brooklyn in two separate pieces separated by Newtown Creek. It runs through industrial regions on both sides of the Creek, but settles into a quiet residential area in Maspeth east of the Long Island Rail Road tracks. 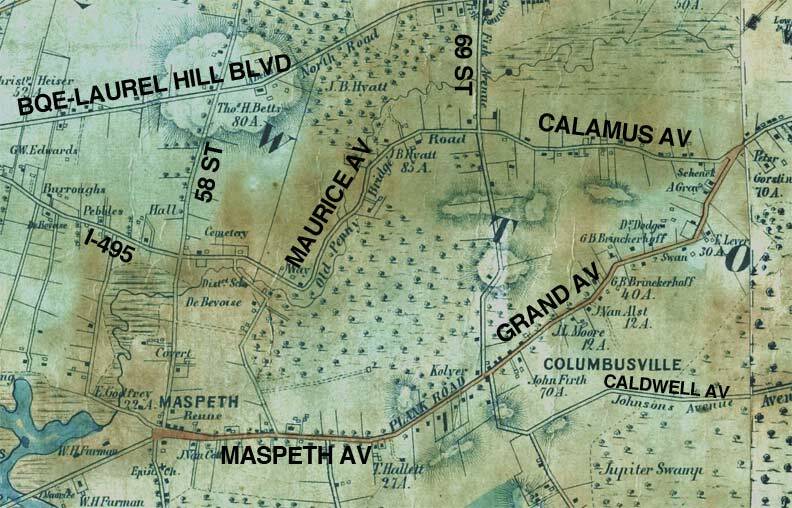 In 1852, Maspeth Avenue was a major route known as the Plank Road and was bridged over the Creek. The bridge was removed as far back as the 1870s and was replaced by a pair of bridges on Grand Street, the second one surviving today. The Plank Road meandered northeast to Elmhurst, angling to avoid farm properties and swamps. 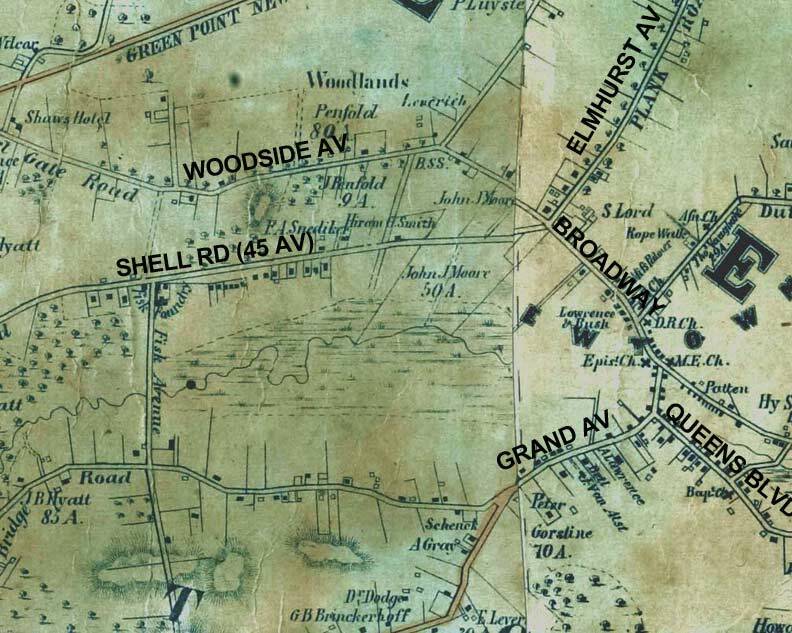 West of where the Plank Road turned northeast, Grand Avenue/Street was extended over the Creek and into Brooklyn, while the meandering Brooklyn and Newtown Turnpike was straightened somewhat and renamed Flushing Avenue (a naming scheme popular in the 1800s was to name a route not for the town through which it passed, but the town to where it ultimately led, sometimes by using other roads). On this map, I’ve drawn in the current 3-pronged junction of Maspeth, Grand and Flushing Avenues that, in 1852, would still be about 40 years in the future. In that era, Mount Olivet Cemetery was brand new. It was first dedicated in 1850; surrounding properties were purchased later, until the cemetery attained its present uneven boundaries. Meanwhile from the same 1852 map, here’s the northeast end of Grand Avenue, where it meets Queens Boulevard and Broadway. Broadway itself was, at this time, simply the east end of Hellgate Ferry Road, which, later renamed as Woodside Avenue, Newtown Road, and Newtown Avenue, was a colonial-era road running from the East River through swampy territory to the heart of Newtown. Queens Boulevard began as a trickle here called Jamaica Road; after Thomson Avenue was built out west to the Woodside area, it was renamed Hoffman Boulevard for a Queens boro president and in 1909, after the Queensboro Bridge was opened, it became Queens Boulevard, absorbing both Thomson Avenue and Hoffman Boulevard. Years of street widenings turned it into today’s behemoth by the 1930s. Some interesting property owners can be found on this map. The Moores produced Clement Clark Moore, who most agree wrote “A Visit From St. Nicholas.” S. Lord is British immigrant Samuel Lord, whose Manhattan dry goods store became the Lord & Taylor retailing giant. Lord & Taylor announced in 2018 it would close its flagship 5th Avenue store. Ancient road maps are endlessly fascinating. Based on your map, in 1852, in order to go from Kings County into the heart of Maspeth and then Newtown, you had to use the Maspeth Ave. Bridge over Newtown Creek, Since Grand St. had not yet been extended into Queens, only what is now Metropolitan Ave. crossed English Kills. (This may be why the bridge situated here has always been named for Metropolitan Ave.) Thus, both bridges served separate communities and were in no way redundant. 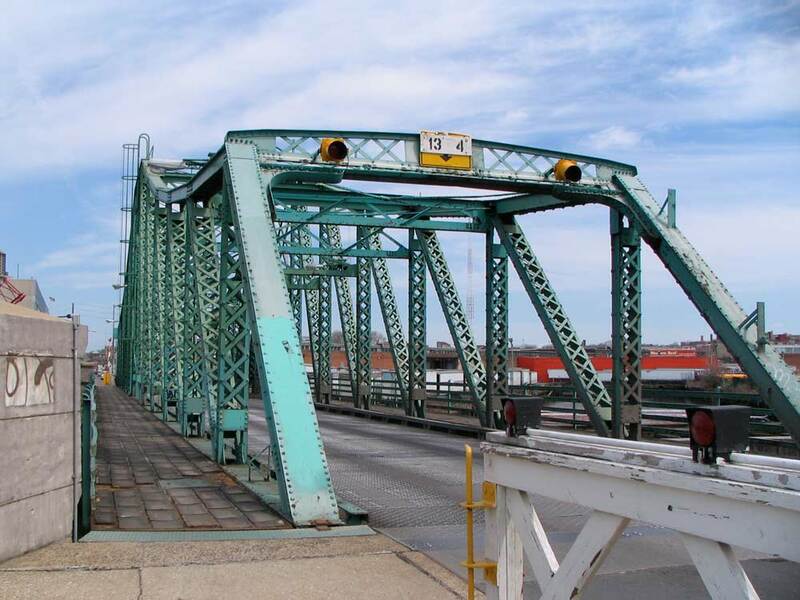 Once Grand St. was extended and crossed the Creek as it entered Queens, the Maspeth St. connection became redundant and the bridge fell into disuse. I am pretty sure – though this will need to be documented – that this occurred well before the 1903 opening of the current bridge and may have occurred as early as the 1870’s. As often occurred, a more primitive bridge was probably initially constructed and then replaced in 1903. This basically should explain why the Maspeth Ave. Bridge disappeared; it simply had lost what was once a very real reason for existence. Thank you so much for this valuable piece of information. It clearly indicates that the demise of the Maspeth was directly related to the 1875 construction of the Grand St. Bridge. It is interesting to imagine how Maspeth would have developed if it had been directly linked to Williamsburg and the busy ferries to Manhattan during late 19th/early 20th century year; its relative of isolation would have probably created a different community – not necessarily for the better. Any thoughts? I’ve always been curious about the path of Newtown Avenue/Newtown road; Especially since both are separated by seven blocks with 30th. (Grand Avenue) bisecting it. Are there maps depicting the entire Astoria section prior to Grand Ave. being laid out? Mr Walsh, M. Waxman and myself all have a deep and abiding connection that old bridge. I used to cross it so often in youthful summers long past perambulating from my Williamsburg home to the Queens Center Mall shops I liked patronizing. It was a nice straight-forward enough route to follow from one point to the other. Fortunately I’ve since relocated to near the terminal end of Grand; I don’t know that my sense of smell would’ve survived otherwise.